Austrian philosopher and historian; born at Brody, Galicia, Feb. 17, 1785; died at Tarnopol July 31, 1840. He began the study of the Talmud at an early age. When barely fourteen he was married, according to the custom of the time, his wife being the daughter of the wealthy merchant Habermann. He then went to live with his father-in-law at Zolkiev, near Lemberg, where he devoted himself entirely to his studies, beginning with Maimonides' "Moreh Nebukim" and studying other Hebrew philosophical writings. He then proceeded to study German and the German philosophers, especially Kant, to read Latin and French classics, and Arabic and Syriac books. Breaking down from overwork in 1808, he went to Lemberg for medical treatment; and the friendship he there formed with S. L. Rapoport, whose teacher he became, was most fruitful for Jewish science. On his return to Zolkiev, after having partially recovered, he again took up philosophy, reading Kant, Fichte, and Schelling, and subsequently Hegel, whose system chiefly attracted him and exerted a great influence on his views. Aside from Rapoport, who often visited him in Zolkiev, he gathered around him a group of young students. In 1814, after the death of his wife's parents, he was compelled to earn a livelihood, and he became a merchant. Twelve years later he lost his wife, and his health became very poor. In spite of failure in business, poor circumstances, and lone-liness, he refused an invitation to the rabbinate of Berlin, and instead obtained a position as bookkeeper in Zolkiev, which he held from 1836 to 1838. A serious illness then compelled him to retire to his daughter's house in Tarnopol; and here two years later he died. Krochmal was a brilliant conversationalist and an exceedingly careful student. For a long time he could not be persuaded to publish any of the results of his studies, in consequence of aspersions cast upon him on account of his friendly correspondence with the ḥakam of the neighboring Karaite community of Kokusow. Krochmal defended himself in a circular letter against these accusations. He was not a prolific writer. Besides some Hebrew essays in periodicals ("Sulamith," 1818; "Ha-Ẓefirah," Zolkiev, 1824; and "Kerem Ḥemed," vols. 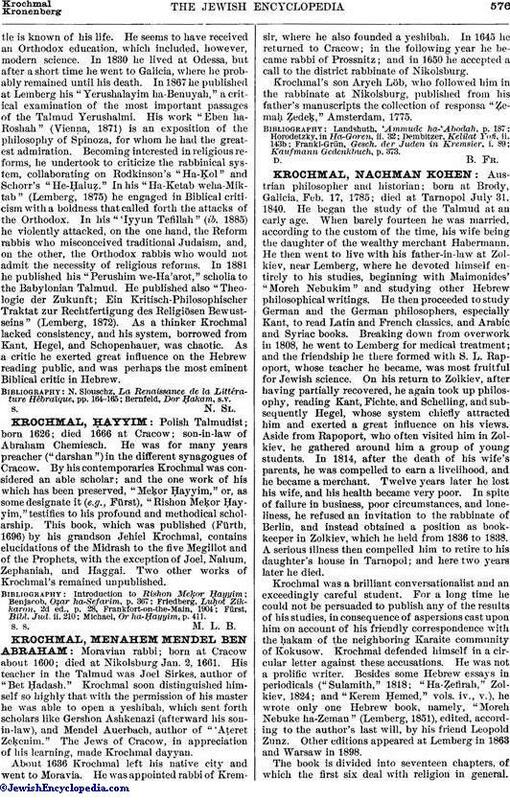 iv., v.), he wrote only one Hebrew book, namely, "Moreh Nebuke ha-Zeman" (Lemberg, 1851), edited, according to the author's last will, by his friend Leopold Zunz. Other editions appeared at Lemberg in 1863 and Warsaw in 1898. The book is divided into seventeen chapters, of which the first six deal with religion in general.Ch. vii. describes Israel's spiritual gift as the desire for and faculty of seeking God. The next three chapters contain a philosophical analysis of Jewish history, which, corresponding to Israel's attachment to the Lord, that is, to its religious development, is divided into three epochs. These epochs terminate respectively: (1) with the death of Gedaliah after the destruction of the Temple; (2) with the death of Bar Kokba (c. 135); and (3) with the expulsion of the Jews from Spain (1492). The author does not characterize the modern period in which he himself lived. Ch. xi-xv. deal with the post-exilic Biblical and the Apocryphal literature and with the various religious movements. The author discusses also the necessity of tradition and gives a critical résumé of the development of the Halakah and Haggadah. Ch. xvi. gives a brief sketch of the future development of Jewish religious philosophy based on the principles of Hegel. The work finishes with an exposition of Ibn Ezra's philosophy. The historical digressions in the book touch the profoundest problems of Jewish science; and it remains their indisputable merit to have paved the way for critical studies in Jewish history. 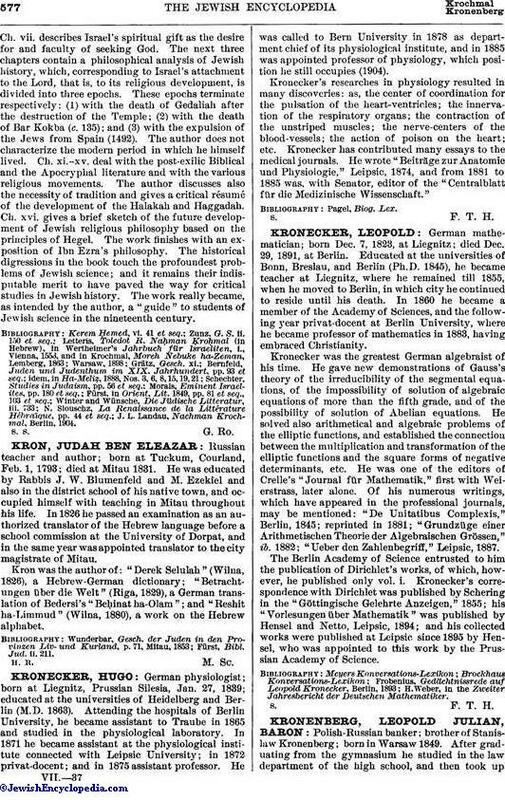 The work really became, as intended by the author, a "guide" to students of Jewish science in the nineteenth century. J. L. Landau, Nachman Krochmal, Berlin, 1904.